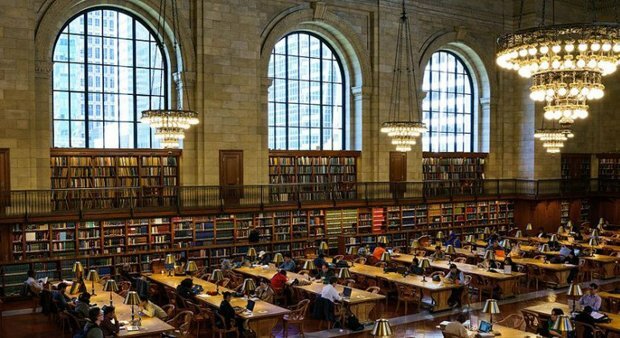 The prospect of a three-hour documentary on the glories of the New York Public Library system may sound daunting; Ex Libris offers such an engaging portrait of a multi-faceted institution that it becomes a warming, vibrant celebration of community and civic amenities. Director Frederick Wiseman brings his trademark style of unobtrusive, observational documentary to bear on a place that feels absolutely central to the beating heart of its city. There is no voiceover narration, no titles spoon-feeding information. Instead, Wiseman is content to eavesdrop and explore, gathering short vignettes of the library's many buildings and activities. There are people researching private passions, playing games, browsing through maps and sifting through a vast collection of photographs. There are lectures and recitals, a careers fair at the Bronx Library Center, a trip to the Braille and Talking Book Library, classes to improve computer literacy, talks from Elvis Costello, Patti Smith, Richard Dawkins and so much more. If anyone was foolish enough to think a library was merely a repository for old books then Ex Libris will definitely make you think again. Throughout the course of the film we witness various officials discussing priorities, education programmes and the issue of digital access in a city where a staggering one third of the population do not have domestic broadband. We are made aware that this is a world that functions thanks to a mixture of public and private finance and does its very best to respond to the needs of its diverse citizens. The result is a film that makes you marvel anew at a beloved landmark that is committed to education and the nurturing of passion. It might even convince you that libraries are more important than ever to the creation of a cohesive, functioning modern society. Selected release from Fri 13 Jul.